While the Woolly Bugger has it's origins in the older British Pattern, the Palmer, most attribute the origins of this fly to Russell Blessing of Harrisburg, Pennsylvania in the early 1970's. Barry Beck promoted the fly and it has become one of the most popular streamer flies of our time. 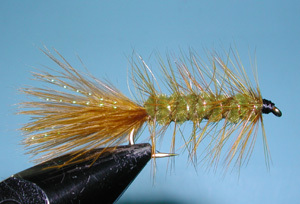 Jack Dennis has suggested that the Woolly Bugger origins are actually a U.S. Western derivation of the Woolly Worm pattern created by Don Martinez in the 1940's. 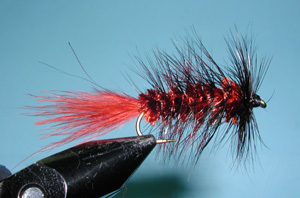 A group of fly fishermen using Martinez' Woolly Worms substituted the Red Hackle tail with Red Marabou, calling the fly "Big Red" or Henry's Lake Leech. In 1967, Russell Blessing added a Black Marabou tail to a Black hackled Olive chennille Woolly Worm. He used the fly for smallmouth bass, suspecting that it imitated a hellgramite known as a Dobsonfly larvae. Barry Beck encountered Russell on the Little Lehigh River in Pennsylvania and found that the fly was extremely successfull. Beck wrote an article on Blessing's Wooly Bugger in 1984 and the fly became one of America's most popular patterns. According to Blessing, the Woolly Bugger was inspired by another pattern known as the Blossum Fly and his daughter, Judy, came up with the name "Woolly Bugger". Black is your best all-around color for these conditions as it develops a good silhouette even under nightime conditions. White works when there is any light available since it reflects the most. Yellow-Chartreuse is the last to lose it's color-value in deep waters. 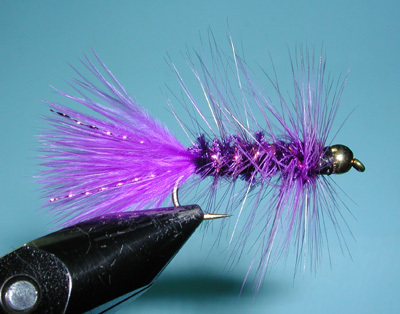 A very simple fly to tie, it is generally one of the first to learn.It can be weighted for stillwater purposes and trolled or stripped with a slight pulsating action. 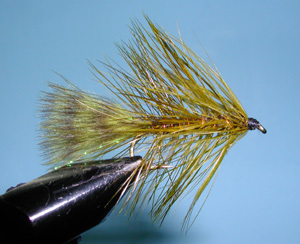 When used for baitfish imitations, the fly should be tied with a full marabou tail. On damsel and stonefly imitations, you can snip off half of the tail fibers. A few strands of Krystal Flash in the tail adds some reflectivity to the fly. Variations of the pattern use different types of beadheads for the head. The body is often modified utilizing Crystal Chenille, Lite Brite, Peacock Herl, and Erstaz Chenille. Rubberlegs can be added for additional action. Basically, the fly allows a multitude of different materials. 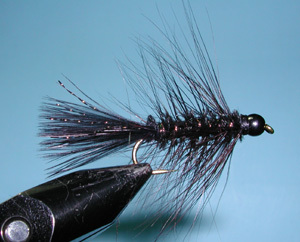 What makes the fly defined as a bugger is (usually) a Marabou Tail with a body that has a palmered hackle wrapping it. Sometimes, this can get confusing, but remember the adage, "If it looks like a bugger, then it probably is."